Owner of School of Business Coaching&Training of Iryna Maretskaya, a Belarusian company specialized in business-education. Executive Coach and Business Trainer. 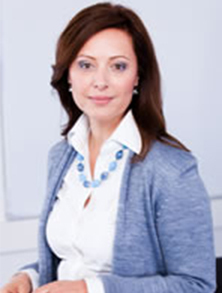 A chartered psychologist and coach, Irina has extensive coaching and teaching experience with national and international companies of different sectors. Her expertise is in leadership development, personal efficiency, management psychology, business communication management, corporate image and corporate culture, effective sales and negotiation. She is the author of a self-developed course on personal development in Executive MBA program (a joint project with Kazminski University, Poland) and the author of a range of training workbooks for corporate trainers in sales and communications with clients. 1. The Professional Diploma in MANAGEMENT/DplMgmt (Open), LINK, 2008. 2. Belarusian State Pedagogical University, Diploma with honors in Psychology, 2003. 3. University of Culture, Director-Producer of Theatre, 1990. 1. Zavialova’s School of Business-Trainers (Moscow), Business trainer, 2003. 2. Training for Trainers Certificate from the New Eurasia Establishment, Minsk, 2006. 3. International Institute for Management Development GmbH, Business trainer Stufe S/ (Moscow), 2008. 1. ICC Certificate. Trainer Training by Andrea Lages and Loseph O’Connor, 2013. 2. ICC Certificate. Basic Training, Minsk, 2012. 3. Coach Institute Certificate, Saint Petersburg, 2005. 4. Workshop in Coaching under personal coaching of Filip Mihailovic (Slovenia), 2009. 5. Coaching on Personal Efficiency, Saint Petersburg State University, 2010. She is an Associate Fellow of the Belarusian Association of Psychotherapists. A member of The OCM Coach-Mentor Associate Group (Oxford, UK).